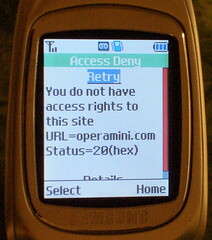 Thanks for the link to the Opera Mini simulator. I don’t know how I missed it, but it’s much easier to work with than actually running it on my phone (slow connection+text entry). Still better than the (similarly crappy WAP) built-in browser, though!